What does it mean to lose your mother before reason and understanding take root? Virginia journalist Margaret Edds, barely three when her young mother died of complications from rheumatic fever in 1950, wanted to know. Drawing on the nearly lost medium of letters and traveling a path that led through Oak Ridge, Tennessee, the secret World War II city that helped birth the atomic bomb, and Lynch, Kentucky, a unique town in the heart of the Bloody Harlan coal fields, she discovered the vibrant, imperfect, deeply human woman at her core. She arrived, too, at a sober realization of how one untimely death can reverberate through generations. 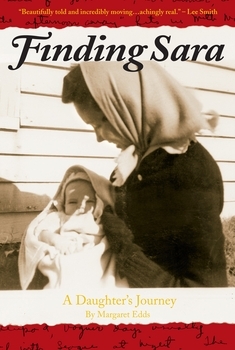 Finding Sara is a unique and heartwarming memoir that resurrects a lost relationship and a gentler America. Margaret Edds is a former political and editorial writer for The Norfolk Virginian-Pilot. She is the author of three previous books: An Expendable Man: The Near-Execution of Earl Washington Jr. (NYU Press, Paperback, 2006, Hardcover, 2003); Claiming the Dream: The Victorious Campaign of Douglas Wilder of Virginia (Algonquin, 1990); and Free at Last: What Really Happened When Civil Rights Came to Southern Politics (Adler & Adler, 1987).